Gemstones have been something that I have been fascinated with ever since I went to Tucson to the Gem and Jewelry Show there. 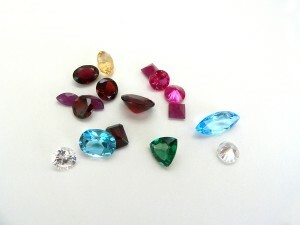 I have to admit that I am much more of a novice when it comes to colored gemstones than I am about diamonds. But, like everything else in life, it’s all in the learning, and I am all about learning. One thing I’ve noticed is that estate and antique jewelry seems to carry quite a bit of different colored gemstones, so it’s important to have a handle on what’s what and to at least be able to recognize the differences in them. If you don’t know the first thing about colored gemstones, then it’s hard to tell an emerald from a tsavorite. Each month I am going to talk about a different gemstone. I will discuss their properties, how to clean them and take care of them, common treatments that are used on them, so you will be aware if the possibility exists if your stone has been heat treated and what that means. In the meantime, to get started, here are some fun facts that show you which gemstones are the traditional birthstone, zodiac signs and anniversary celebrations!